Revolutionary vehicle safety product, Cyclear™ from Innovative Safety Systems Ltd (ISS) is now helping to protect cyclists in Coventry, the city where it was designed and built by Coventry University Graduate and ISS Director, Gavin Thoday. 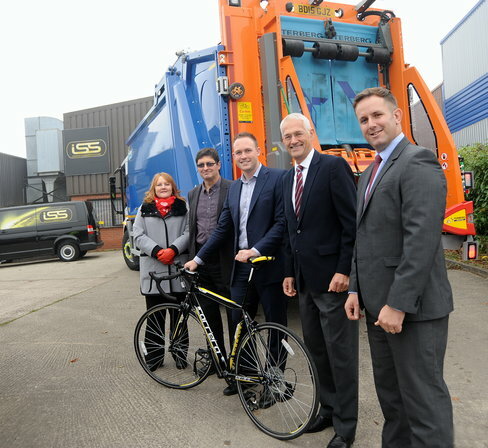 Cyclear™ has been fitted to the City’s latest refuse vehicle built by Dennis Eagle and ISS invited several leading Coventry and Warwickshire figures to see the product in action as it was set to hit the city streets. Coventry-based Innovative Safety Systems (ISS) developed the warning system, which can be fitted to a wide range of HGV’s, to alert cyclists and other vulnerable road users when a vehicle is planning to turn left, a manoeuvre that is a major cause of cycling injury and death across the UK, particularly at junctions. It is now in operation on hundreds of vehicles across London, Scotland and the rest of the UK. Jonathan Browning, Chair of Coventry and Warwickshire’s Local Enterprise Partnership, said: “ISS has developed an innovative new product which is already proving very popular across the country and undoubtedly helps cut down risks on the road, and it was developed by a Coventry University graduate. Browning is also non-executive director of British Cycling, the national governing body for cycling which is currently campaigning for better road design and traffic management infrastructure as part of its #ChooseCycling campaign. Mike Crowther, of ISS said it was rewarding to see Cyclear being used on local roads. Cyclear™ works in stages. A left hand indication from the driver triggers an internationally recognised sign on the rear of the vehicle to illuminate along with an audible “Caution Vehicle Turning Left” sounded to alert cyclists and pedestrians of the driver’s intended left turn. At the same time an intelligent sensor system mounted along the nearside of the vehicle will alert the driver if a cyclist chooses to undertake the vehicle into their blind spot. ISS designs, supplies and maintains vehicle safety and efficiency equipment, most of which is manufactured here in the UK. Its product range includes vehicle CCTV, Hard Disk Recording, Remote Footage Download Systems, reversing radar, fuel saving modules, vehicle-tracking systems, LED lighting and warning beacons. For further information about ISS on tel:02476 442699 or visit www.iss-international.co.uk.